Myofascial Release (MFR) is a hands on therapy that addresses connective tissue (fascia) restrictions and imbalances. 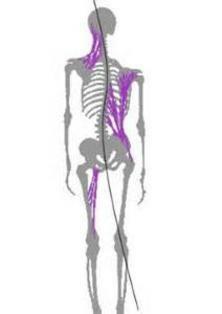 This fascial restriction can occur due to any number of factors, including poor posture, injury, surgery, inflammation, stress, and habitual irritants. MFR benefits include reduced pain, improved flexibility, postural gains, deceased stress, and enhanced sports performance. Fascia is cobweb-like matrix of tough connective tissue that runs continuously throughout the entire body and surrounds and infuses every part of the body, including muscles, bones, arteries, spinal cord, nerves, organs, and cells. Because there is no beginning or end to the fascia, any one part of the fascia tightening can cause tightness and pain at another part of the body. This is why it is so important to look at the body as a whole and treat the areas of fascial restriction. In fact, fascia is the very structure that holds us upright, and, as shown in the picture below, can cause malaligment in our structure. The tissue in purple is the fascia. This person could be having pain in the neck, back, hip, knees, shoulder, head, TMJ, etc. By applying MFR, the tissues would elongate, restore proper alignment, and likely decrease pain. The therapist will place her hands on an area of fascial restriction and allow the tissues to unwind under her hands. This allows the tissue to go from a solid restriction to its more open configuration. To you, it will feel like a softening, pulsing, wave or heat. The therapist will follow the restriction to allow maximal release and benefit. You may be a little sore afterward, but as the fascia unwinds, the body will be in a better position to promote healing. By filling out the form, you are providing express consent to receive communications from Core Wellness and Physical Therapy. You may opt out at any time. Copyright (2018) Core Wellness and Physical Therapy. All rights reserved.